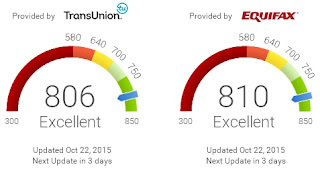 Just got my updated +TransUnion® and +Equifax® credit scores from the +Credit Karma® website; 806 and 810 respectively. These scores are based on the VantageScore 3.0 scoring model. I'm hoping that one day soon, Credit Karma will offer free scores from +Experian® too. Two out of the Big 3 for free, seems like an awful tease to me!